"What's wrong with wanting more?" Creative Playbill Poster. Note..the poster printed on quality paper is unframed. 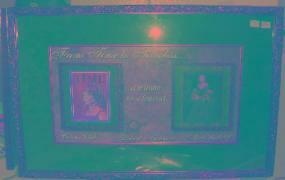 It is shown in a custom frame, with sude mat which may be purchased for a total of $375.00 This original and creative poster is a fun and beautiful piece. It is 12" x 24" and very crisp...more so than the original as each print has been digitally enhanced. Frame not included Yentl's tag line, "What's wrong with wanting more?" as well as the Barbra Streisand Fifth Reunion purchases I made of simulated Playbills , were my inspiration for this piece. I want to acknowledge the brain power behind these wonderfully creative originals...Tom Rubeck, Eva Rice, Geoffrey Eichhorn, Sheri Kamer and Allison Waldman I applaud them for their collective creative genius, as I have been informed that the Playbills were their ideas, as they prepared for the Fifth Barbra Reunion in 2001. I want to thank them publicly for giving me, and others who have viewed my original creation, years of fun with their novel creations . Now I hope to share their and my creativity with a lucky few more people! 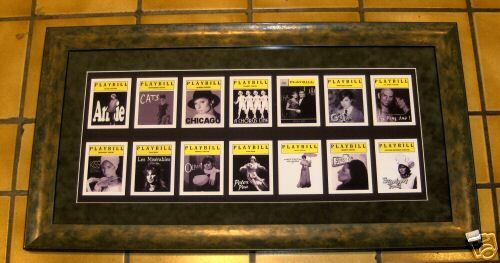 The original of this piece, which I titled Imagine the Possibilities, framed and matted with 13 "imagine" Playbills alongside an original Funny Girl Broadway Playbill, has been displayed at Detroit's legendary Caucus Club, LA's The Hollywood Museum and the Palm Springs Barbra (Barber) Shop. Playbills included are Cats, Sunday in the Park Wih George, Kiss of the Spider Woman, Chicago, Cats, Les Miserable, Annie, Sweeney Todd, A Chorus Line, The KIng and I,Sunset Boulevard, PeterPan, Oliver and of course...Funny Girl . This piece has continually been... and still is a crowd pleaser and everyone's favorite! This creation is certainly a conversation piece. (Personally I get a chuckle out of it when someone tells me they have seen Barbra in Les Mis!!!! ) The waiters at Detroit's Caucus Club actually dubbed a table for six immediately under the Imagine the Possibilities piece as "The Liar's Table. " They would tell me that their attorney clientele, in efforts to impress other with whom they were lunching, would comment that they saw Barbra in Cats...Sunset Blvd...etc! Situation like this happened all the time! "What's Wrong with Wanting More?" Creative Playbill Poster. made of simulated Playbills , were my inspiration for this piece. I applaud them for their collective creative genius. their novel creations . Now I hope to share their and my creativity with a lucky few more people! The Hollywood Museum and the Palm Springs Barbra (Barber) Shop. This piece has been continually... and still is, a crowd pleaser and everyone's favorite! to work at the salon, partner in the business or to buy the business. tidbits about many of the offerings. coffee table to share with friends and one for safe keeping. collectible for 59.99 in an ebay store. Avenue, prior to the June 2004 auction in Hollywood. click the above " BUY NOW"
T-shirts are now available from this site. Sold originally for $25-$40. These are brand new...never worn. Buy them for $6.00 each here! Shipping only $5.00 in US. Barbra's FIRST non New York City Venue. in the comments section. Thank you!